Mixed attainment: why mix them up? Traditionally, teaching has organised children into “ability” groups and teachers have differentiated learning objectives to meet each child’s needs. Research shows that if children are grouped in this way, they are effectively pigeon-holed for the rest of their school lives (i.e. If you start off in a “low ability” group, you tend to stay there until you leave school). In my experience, the children themselves are very aware of their pecking order in classes that are organised in this way – i.e. “Low ability” children tend to have a low self-esteem and often develop a learned helplessness where they wait to be spoon fed. “High ability” children often become used to always getting the “right” answer and are afraid of a challenge. For this reason, as well as many others, I aim to teach mixed attainment groups as often as possible. Developing confidence in all learners. Carol Dweck’s research into growth mindset encouragingly shows that once we start to loosen up the boundaries of these groups, children begin to believe in themselves more and become more willing to take risks. Again, in my experience, this is what happens – children who previously were unconfident and felt that they “couldn’t” start to try out new ideas and find that, in fact, they can. It is an absolutely joyful thing for a teacher to see a child gain confidence in this way (and parents have often reported on their children gaining in confidence at home from this style of teaching). The diagram below comes from Helen Hindle’s site (@helenhindle1). It explores some of thinking behind teaching through mixed attainment groups. Helen Hindle’s website http://www.growthmindsetmaths.com/ is a feast of ideas and thinking behind mixed attainment groupings. She regularly runs workshops on mixed attainment which would be great to attend to find out more. How can I plan for fluid groupings and mixed attainment? keep the groups fluid so that the children don’t always feel they are in the “low ability” or “high ability” group (which might have a different name, but the children still know what it means!). think carefully about a good mix in each group. More on this here and here. 1) Starting learning with an open-ended question. How many different ways can you make a number line to 10/20/100? whether they would make the line alone or with a friend. The range of ideas and resources makes this activity really open-ended and we’ve had some fantastic challenging learning from the children. For example, when making a number line to 100, three children decided to make one counting in fives and when they had finished, decided to explore negative numbers. Considering they were 5 and 6-year-olds, I think this was pretty impressive! What new 2D shapes can you discover? This lesson started with an exploration of shape and properties of shape. Again, we had a range of resources for the children to explore shape, such as metre sticks, big pieces of paper, Geoboards. The lesson followed a similar pattern as the one above. 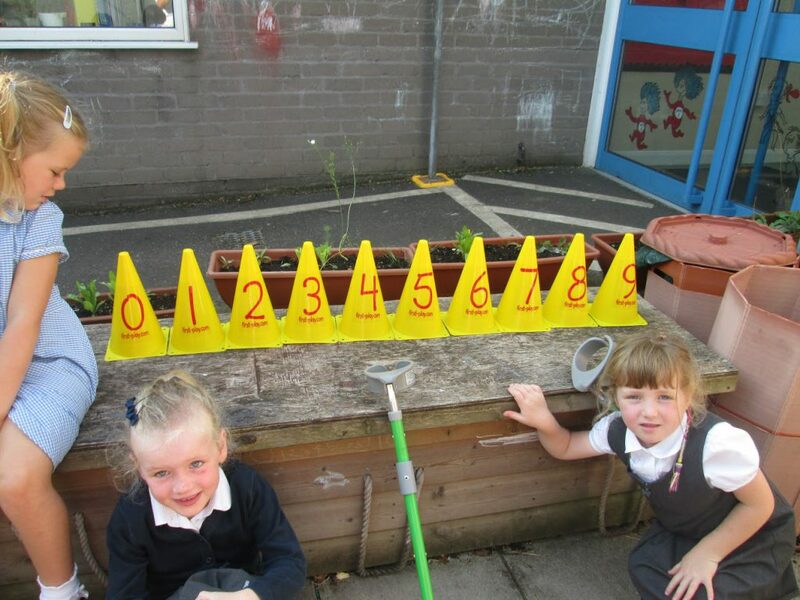 Since the learning was so open-ended, the children felt confident to explore in their own way. They also had the space to ask their own questions and follow up their own lines of inquiry. In this lesson, we ended up discussing right angles and two children chose to explore all the shapes that had right angles in. This links to “could be” language – it was much more engaging for the children to discover a range of shapes for themselves than to be told they needed to learn about triangles, squares and circles (an “is” way of teaching). The main problem I could envisage, if the children aren’t used to this way of teaching, is that the children might get distracted. The way I teach the children to focus during this kind of learning is through using the Learning Ladder to talk about challenge and by highlighting great examples of the children challenging themselves (like the ones mentioned above). I would also talk about expectations with the children before they went off to start their chosen activity. I make sure every child leaves the carpet with a plan in mind. In this way of grouping the children, the teacher creates a list of activities around a learning objective. Each activity gets progressively harder and is related to a hotter chilli. 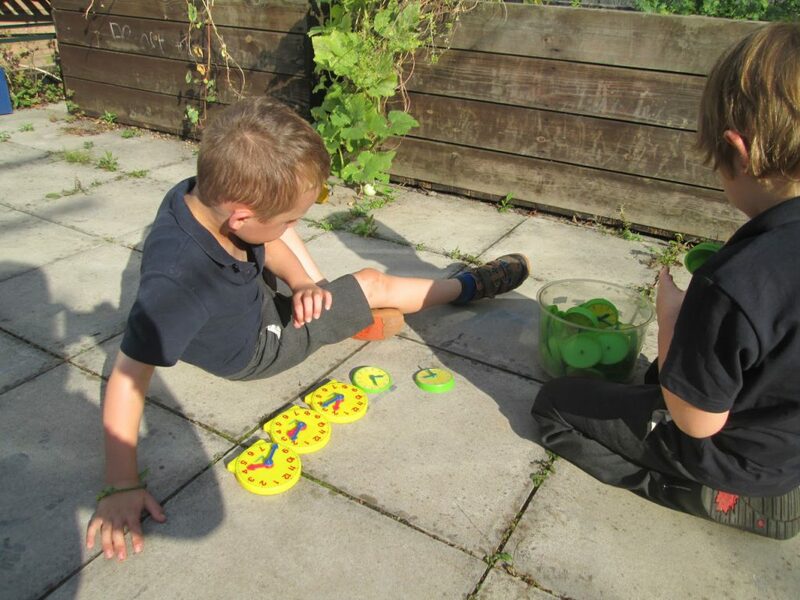 The children self-assess which activity they think would suit the level of challenge they need. I have written a blogpost on introducing learning with the chilli challenges. In order to challenge and include all children, I often put children together in mixed attainment pairs (or the children have chosen for themselves, depending on the learning). The children plan and collaborate with their partner, choosing their level of challenge and extending themselves from there. Sometimes the pair work closely together, sometimes they work on different challenges, but refer to each other for support. By choosing their own level of challenge, the children are gaining self-awareness as learners. I have found they are very good at gauging how challenging their learning should be. 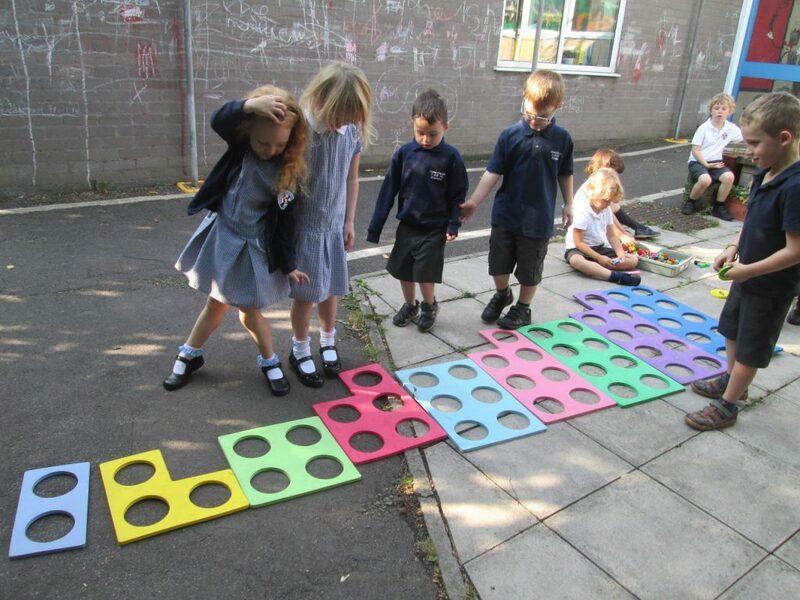 Used in conjunction with the Learning Ladder, children develop a relish of challenge and enjoy stretching themselves. It is great learning for them to learn how to push themselves further. Even trickier, for them to step back and take stock if their learning is too tricky. 3) Mixed attainment groups and independent learners. some children who were more confident to try a challenge, some who sometimes struggle. So, the children are grouped on a good social mix rather than “ability”. One of the advantages of mixed attainment grouping is that teacher is freed up to target children who will find a task harder. This is much easier to do if there are only one or two children like this in one group rather than having a whole group to support. It also means the children can learn from their friends through collaboration and “being a teacher”. Of course, your role as a teacher is to make sure the children are on track and aren’t feeding into each others’ misconceptions. Two groups work directly with an adult. Here, we would teach the children a specific skill we wanted them to learn (for example, using descriptive language in writing or adding 2 numbers together). Within that learning objective, we would have chilli challenges. For example, when adding 2 numbers, the numbers could get progressively harder. The children start from where they feel comfortable and work their way up. The other two groups have an “independent learning menu”. This has a range of activities and ideas related to the learning objective. This might include learning through art, games outdoors, a computer game on the interactive whiteboard that will consolidate their learning. Again, because the children are in mixed attainment groups, they have opportunities to constantly learn with a range of children. The activities are open-ended, encourage independence and develop a range of learning habits. I have found this way of teaching empowering for the children. I have seen apparently less confident children try trickier learning because they are with a partner who will encourage them to take risks. By the end of the lesson they have got it – and the smile on their face is gold! Because the groups are always changing, children are unaware of who is “higher” or “lower” ability. And, in this way, I have seen some apparently unconfident, “low ability” children gain huge amounts of confidence and make impressive progress because they begin to learn that they CAN take risks and ARE capable of learning the same as their peers (or more!). This type of attitude change is the main reason I feel so strongly about Learning Power Approaches. They open doors for children and instil a true love for learning. I have tried other ideas, such as children choosing the “how” of learning, some of which are described in more detail in my blog. A) using just two triangles how many shapes can be createdunid by reflecting them through each different length side. B) what are the names of the shapes produced? C) if we name the three sides of the triangle a, b and c where a is the shortest side and the longest. What are the perimeters of the shapes? E) what new shapes do we gain by rotating triangle two about each side a, b and c?